Naomi Powell is a business journalist with the Financial Post, covering Canadian real estate from a national perspective. 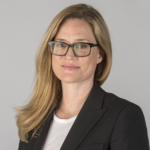 Prior to joining the Post, she was based in Stockholm and Dublin, where she wrote about European property markets and economics for the Globe and Mail, the Wall Street Journal, and the New York Times. She is the recipient of a National Newspaper Award for breaking news and a Michener citation for excellence in public service journalism.